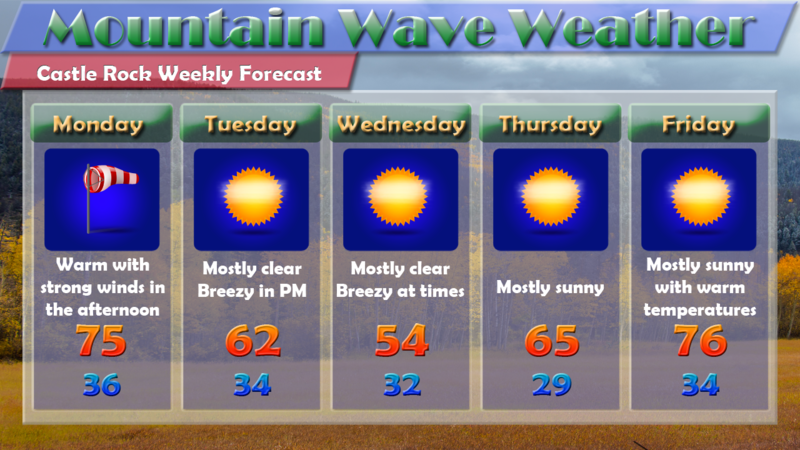 In many ways, the weather for Colorado this week will be similar to last week. This week’s weather will feature a handful of very warm, windy and dry days with a quick shot of cooler weather midweek. At this time the chances for any rain over the next 7-10 days are not looking great. Monday especially looks to be a wild day with warm temperatures, very high winds and fire danger across most of the state. Let’s start off with some of the notable weather warnings, followed by the forecast and a look at the setup for the week. Encompasses all of Eastern Colorado, the front range, front range foothills and mountain areas. FOOTHILLS AND PLAINS OF NORTHEAST COLORADO ON MONDAY. The Warning area mainly includes mountain locations and areas of the Palmer Divide and foothills West of Colorado Springs. OUTAGES AND TREE DAMAGE MAY ALSO OCCUR. High fire danger due to low humidity and strong winds for Monday. Expect temperatures to top out in the mid 70’s early in the afternoon before a cold front moves through. 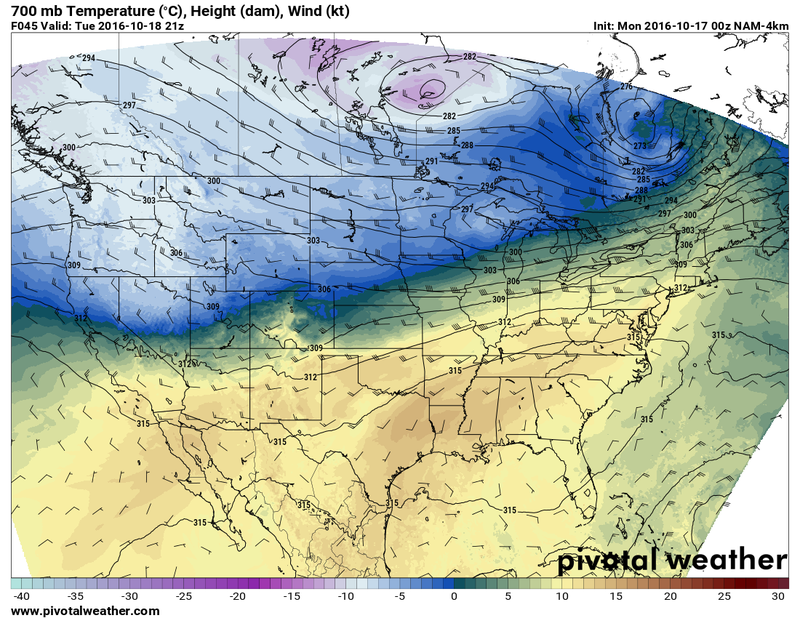 Most models have the front moving through in the 4PM-6PM time frame. In advance of the front, expect winds to really crank up, the the tune of 20-40MPH with higher gusts possible. As the front passes through, expect falling temperatures into the evening hours with winds decreasing after dark. Tuesday will see mostly clear skies across the front range with temperatures about 10-12 degrees cooler than Monday. Breezy conditions may redevelop by the afternoon hours but we are not expecting the same strong winds we see on Monday. Wednesday will have mostly clear to sunny skies with notably cooler temperatures. Breeze looks light throughout the day. 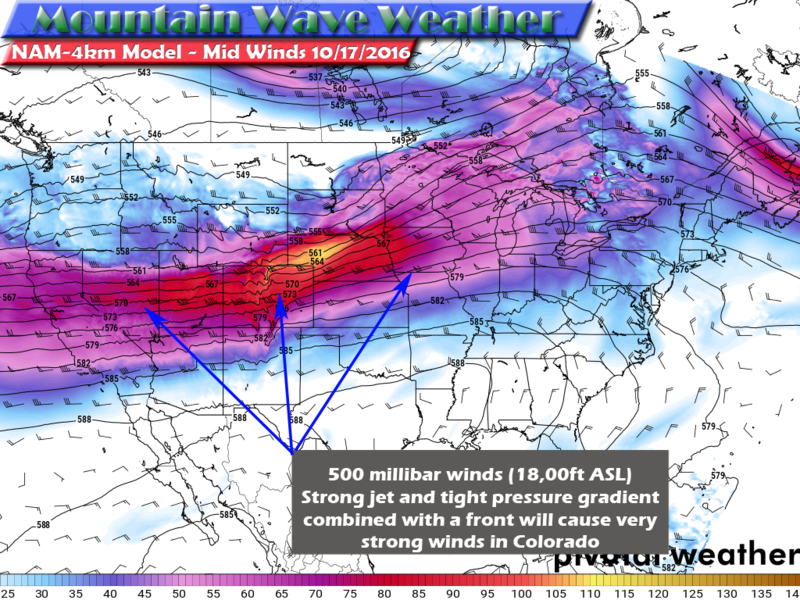 As the front and associated trough begin to move Northeastward we will see the re-establishment of ridging in the atmosphere bringing warm and breezy conditions back to the front range. Friday looks to be especially warm with breezy conditions. We are expecting little to no precipitation for the week in and around the Castle Rock area. The biggest story on Monday will be the wind! 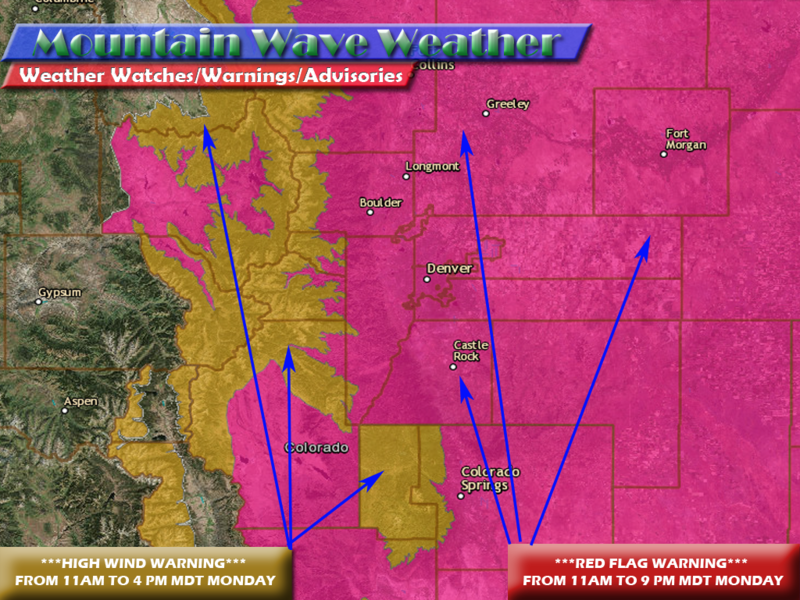 Colorado has an interesting setup for strong wind conditions across the state on Monday. A strong cold front moving in from the North combined with a strong jet stream moving over the state means winds aloft will be very strong. Values of over 100 kts are screaming along at the 500mb level, or about 18,000 feet above sea level. The highest winds will remain aloft meaning the mountains of Colorado will get the worst of the windy conditions through the day. As we move into the afternoon hours the front moves through, will shift the winds and cool the temperatures off quite a bit into the evening hours. As we begin to get a bit of mixing in the atmosphere and instability those winds aloft will begin to get pushed down lower towards the surface, meaning we will begin to see stronger winds in advance of the front. 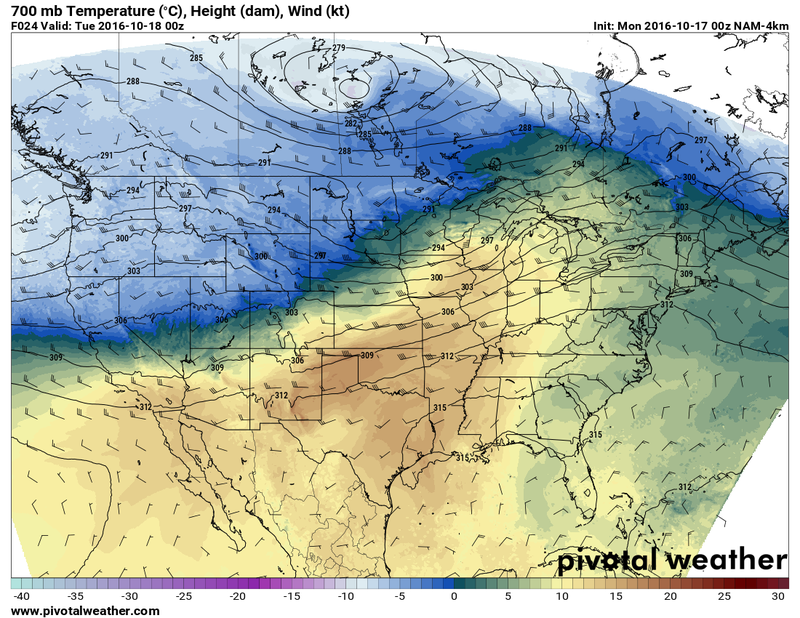 This temperature model shows the front quite clearly this afternoon around 6pm as it’s made it’s way into the state. You’ll notice the large pool of colder air to its North, this blob of cold air doesn’t’ quite make it firmly into Colorado. By Tuesday and Wednesday some of the cooler air brushes us but the brunt of it remains North into Wyoming and the Dakotas. Also, because this is another land mass based front, we don’t expect to see a ton of moisture from this storm system making it into Colorado. The GFS and many of the main models show the mountains picking up a bit of precip throughout the week, mainly in the form of snow. Notice how Eastern and Southeastern Colorado stay totally dry. This model shows how much precipitation total it expects these areas to receive through next Saturday. Bone dry! The ensembles try to bring us a tiny bit of moisture after the passage of the front into Tuesday and Wednesday but the amount they average out to is about 0.01 inches. That doesn’t give me a lot of confidence of seeing precipitation midweek. This week look very similar to last week, mainly warm and dry days with a quick shot of cooler air in the middle of the week. Based on model guidance, I won’t say the chance of seeing rain is 0% this week but most models are showing no precip for the Palmer Divide area through the week. The few that do show precipitation are not terribly convincing. Thanks for reading and I’ll post any changes/updates to the forecast if necessary through the week!